Hetch Hetchy Reservoir is the longstanding answer to the question, "What's the most outrageous thing you can get away with in a national park?" Observers who saw the Hetch Hetchy Valley in its original state thought it resembled a smaller mirror image of Yosemite Valley, but after an act of Congress in 1913, the dam was built and the valley disappeared. 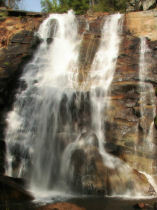 It's been replaced by a giant tub, complete with bathtub ring, and the steep walls make it inaccessible except for the single trail along the Wapama Falls side. Reading this page hasn't been a complete waste of your time, though. The top 1,400 (yes, 1,400) feet of Wapama Falls remain visible above the reservoir and well worth visiting, and the Big Oak Flat area, which is lumped together with Hetch Hetchy for convenience, boasts its own grove of Giant Sequoias. 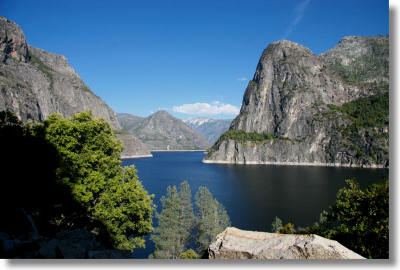 At under 4,000 feet (1,200 meters) in elevation, Hetch Hetchy is the lowest part of Yosemite, and consequently probably best for winter and spring visits, before the weather gets too hot. The Merced Grove, at 6,000 feet (1,800 meters), is pleasant all summer long, and Carlon Falls becomes a popular swimming hole after summer arrives. If you'd like to see the Hetch returned to its natural state, check out Restore Hetch Hetchy, a non-profit group devoted to the valley's restoration. Listed distances for all hikes are round trip. There's no lodging in Hetch Hetchy itself (though there is a backpacker's campground), but the recently refurbished Evergreen Lodge in Camp Mather, with cabins originally built to house the workers erecting the Hetch Hetchy dam, is just outside the Hetch Hetchy entrance. Buck Meadows and Groveland, though not as close, also provide good access to the Hetch Hetchy area. The Evergreen Lodge in Camp Mather has a restaurant, a bar, and a small snack shop. The restaurant is casual but has a more adventurous menu than you'll typically find in rural restaurants, with dishes like hava-bean veggie burgers and pan-seared trout; prices run from the $10 range for sandwiches up to $25 for some entrees. At Crane Flat, the beginning of the Tioga Road. The gas station closes early, but if you've got a credit card you can buy gas at the pump at any hour. Note: if you're on a cell phone, you'll probably have to zoom the map out to see all the trails.